Jenner Gulch is the last named stream to enter the Russian River before it enters the Pacific Ocean. It drains a basin of approximately 3 square miles. This is a first order stream and has approximately 3.3 miles of blue line with no significant tributary input according to the USGS Duncans Mills 7.5 minute quad. Elevations range from about 1600 feet to 0 feet at the mouth of the creek which lies in the town of Jenner. The creek originates from mountain springs in the headwaters, runs down a steep rocky gulch through a U-shaped canyon before leveling off toward the mouth. Over half of the Jenner Gulch watershed was purchased by Sonoma Land Trust as part of the Jenner Headlands acquisition. The upper portion and western portion of the drainage is part of the Jenner Headlands while eastern side of the drainage still privately owned. 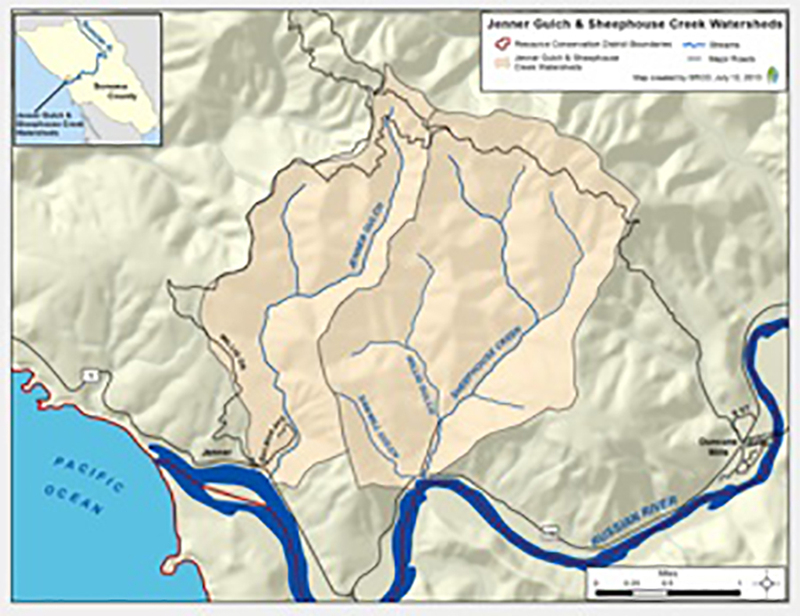 The Sheephouse Creek watershed is located approximately 8 miles west of Guerneville. This 3.4 square mile watershed consists of four primary drainage basins which include; Sheephouse Creek, East Branch Sheephouse Creek, Willig Gulch, and Sawmill Gulch. Together, these basins contain 6.3 miles of blue-line stream. Sheephouse Creek is a second order creek that flows from north to south and has elevations ranging from 1500 feet in the headwaters to 40 feet at its confluence with the Russian River. Slopes of the upper watershed are steep and forested but open to low gradient grassland near its confluence with the Russian River. This watershed is bordered by Jenner Gulch to the west, Austin Creek to the north and northeast, Orrs Creek to the east, and Russian River to the south. Approximately two-thirds of the watershed is privately owned while the upper third was purchased in late 2009 by the Sonoma Land Trust as part of their greater Jenner Headlands acquisition. The Sheephouse Creek and Jenner Gulch watersheds were each heavily logged in the past. A narrow gauge railroad was created that went along the Mainstem of Sheephouse Creek to an old mill located with the confluence of Sheephouse Creek and East Branch Sheephouse Creek. One can still see signs of the old railroad bed and foundations of the mill and its machinery, but none of this is in use today. These days timber extraction is still active in the Sheephouse Creek watershed at a much smaller scale. Cattle grazing occurs in the lower reaches of Sheephouse Creek and Jenner Gulch. There has been little rural development within these watersheds. Both the Sheephouse Creek and Jenner Gulch have similar vegetation regimes. The predominant vegetation throughout the area consists of Douglas fir, redwood, maple, and alder in the upper watersheds which open up to willow, bay laurel and grassland in the lower reaches. Several listed species are found within the Sheephouse Creek and Jenner Gulch watershed. Among the endangered species are the Oncorhynchus kisutch, coho salmon, and the Syncaris pacifica, the CA freshwater shrimp. Threatened species that have been documented in the watershed include the Rana draytonii, CA red-legged frog, the Oncorhynchus mykiss, the steelhead trout, and the Strix occidentalis caurina, northern spotted owl. Also, bank swallow (Riparia riparia (nesting)) and the red tree vole (Arborimus pomo) is listed with a federal status of species of concern in the DFG’s Natural Diversity Database. Habitat levels for each of these species vary throughout the Sheephouse Creek and Jenner Gulch watersheds. To improve habitat in the watersheds, recommendations include increasing riparian canopy, road repairs to reduce sediment delivery into stream, and increase instream habitat with structure installation and wood retention. A natural fish barrier in the lower reaches of the Jenner Gulch drainage prevents salmonids from passing through to the upper reaches of the creek but improving conditions upstream will help what habitat there is downstream. Since 2001, Sheephouse Creek has been involved in the Russian River Coho Salmon Captive Broodstock Program in which biologists from UC Cooperative Extension and Sea Grant release coho salmon smolts in the creek and monitor their progress. The watershed has been seeding with over 16,000 juvenile coho salmon since 2004. The history of logging in the Sheephouse Creek and Jenner Gulch watersheds has left a lasting impression on the landscape. One of the primary impressions comes in the form of both active and legacy logging roads. With the invention of tractor logging in the 1950’s it became popular practice to cut small roads into where logging was taking place and use these roads to drag, or skid, the logs to a broad landing areas. From these landings, logs could be loaded onto trucks and taken out on much larger roads to local mill sites or, in the case of Sheephouse Creek, the mill was located in the watershed and timber was then hauled out of the watershed. Many of these roads were cut across steep and geologically unstable hillslopes in close proximity to streams and were not installed with proper drainage designs in mind. In the years since the time of heavy logging in the two watersheds, these legacy roads continue to have detrimental effects on the hydrology of the area by diverting streams out of their natural channels and by eroding and contributing fish-choking fine sediment to the waterways. While many of the roads in these watersheds are still in use, many have been abandoned and still contribute sediment to the local hydrology, and, while some are being actively maintained with more updated drainage practices, generally speaking, there is always room for improvements. The assessment and improvement of roads for sediment reduction is a primary habitat restoration priority in the Sheephouse Creek and Jenner Gulch watersheds. California Department of Fish and Game has been active with stream surveys in these two drainages that monitor both stream conditions as well as look for species of fish and amphibians. Through these surveys, recommendations are made for actions to help improve habitat quality. As part of the Russian River Coho Salmon Captive Broodstock Program biologists from UC Cooperative Extension and Sea Grant monitor fish activity and habitat quality within the watershed. The Jenner Headlands Sediment Source Assessment was completed by the RCD in 2011 which assessed 48.4 miles of road in the preserve for point sources of erosion. This study resulted in a sediment reduction plan for the entire Jenner Headlands property. The Wildlands Conservancy has implemented some sections of the plan on their own, in addition to the RCD’s road project in the Sheephouse Watershed, and is pursing funding to implement the other sections of the plan in the future. Through the RCD’s Rural Road Improvement Program road assessments and erosion decreasing improvement plans have been completed thoughout the watershed. 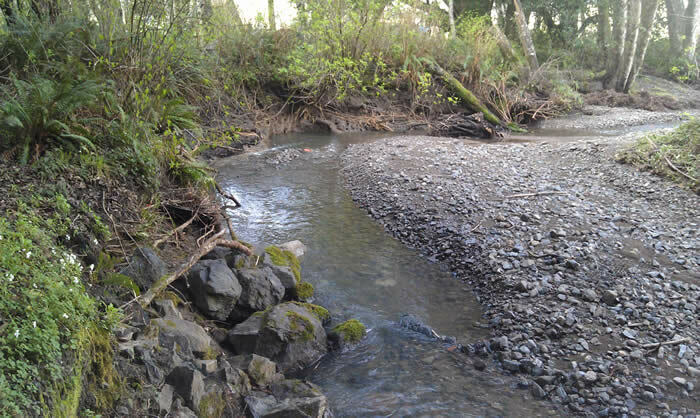 The Sheephouse Creek Sediment Source Assessment was completed in 2011 by assessing 30 miles of road within the Sheephouse Creek watershed for point sources of erosion with connectivity to the stream network. Aa a result of this assessment, a sediment reduction plan was developed and proposaed for funding. The Sheephouse Creek Sediment Source Reduction Project is slated for Summer 2013 implementation and the sediment reduction plan will prevent over 13,000 cubic yards of fine sediment from entering Sheephouse Creek and its tributaries over the next decade. The Jenner Headlands Sediment Source Assessment completed by the RCD in 2011 which assessed 35 miles of road in the preserve for point sources of erosion. This study resulted in a sediment reduction plan for the entire Jenner Headlands property. The Jenner Headlands Physical and Biological Stream Assessment and Monitoring project was completed in 2011. 1000 ft of Jenner Gulch was surveyed by Sonoma RCD staff for habitat quality. Parameters included: canopy coverage, pebble counts, woody debris volume measurements, cross-section and thalweg surveys, pool and riffle. measurements, and benthic macro-invertebrate surveys. Sheephouse Creek Sediment Source Reduction Project was funded for implementation from California Department of Fish and Game with match funds from Sonoma Land Trust and materials matches from local landowners in 2012. Construction efforts for the Project were completed over three seasons between September 2012 and October 2014 where almost 7 miles of hydrologically connected roads were upgraded and another 2 miles were decommissioned. Sediment delivery features treated with specific erosion control measures included: 71 stream crossings, 2 bank erosion locations, 7 ditch relief culverts, 6 landslide/slope instability features, 7 road surface discharge points and 1 spring. The work is estimated to reduce potential impacts to Sheephouse Creek and its tributaries by reducing over 13,000 yd3 of sediment delivery. This project provided a unique opportunity to treat virtually an entire watershed with one “storm-proofing” project. For more information about the Jenner Gulch or Sheephouse Creek watersheds, please contact Kevin Cullinen at 707.569.1448 ext 103 or kcullinen@sonomarcd.org.